A traditional Vegas style three reel slot with the twist of featuring five paylines, Bermuda Triangle might not be able to make you disappear into hours of gaming fun but it certainly is an easy game to pick up and play. Aimed at those players who want simplicity and prefer regular but smaller payouts, the slot has no special symbols, no bonus round and pretty straightforward graphics, too. Bermuda Triangle is so easy to play that even someone who has never played a slot game before will be able to pick it up in no time. A comparatively high 96.73% theoretical return to player percentage is ensured by the regularity of the slot’s payouts. Payout sizes are much smaller than those found with other more complicated slot games and are still a little stingy compared to other Vegas style alternatives. Gameplay is very simple and gets really repetitive given that there is no bonus round and no special symbols to add extra interest. Staking options are very limited as the five paylines are all always active and line bet options extend from just 1p to £5. Themed around the phenomenon of the Bermuda Triangle, an area in which ships and planes legendarily disappear, the eponymous slot’s reels are populated with such vehicles as well as a few sea creatures. The most valuable symbol of all is that depicting a sailing ship and a three sailing ship combination across different paylines triggers the slot’s five largest jackpots. If the combination appears on payline five it is worth the top jackpot amount of 1000 times the line bet, which at the highest possible line bet of £5 would be worth £5000. If the same combination appears on payline four, three, two or one, meanwhile, the jackpot will be worth 700, 600, 500 or 400 times the line bet respectively. Bermuda Triangle is unquestionably a slot game which takes the opinion that lees is more and, as such, does not offer players any additional features. The entirety of the slot’s gameplay, therefore, comprises spinning the three reels and trying to achieve valuable payline combinations. Befitting the slot game’s theme, behind the sailing ship symbol it is the aeroplane symbol that is the next most valuable. If three of those symbols align along an active payline, the lucky player will receive a jackpot worth 150 times their chosen line bet. Interestingly, Bermuda Triangle also allows for mixed and matched combinations of the aeroplane and sailing ship symbols. If any of the paylines include only those two symbols, therefore, a jackpot worth 100 times the line bet is triggered. Away from the vehicular symbols, the other symbols on the Bermuda Triangle reels depict different sea creatures. Three symbol combinations of the sea creatures are all worth less than those of the assorted vehicles. In a similar vein to the simplicity of the Bermuda Triangle gameplay, it is also very easy and straightforward for players to alter their stake amount per spin. All they need do, after all, is to select their chosen line bet as the slot’s five paylines are all always active. When it comes to choosing that line bet amount, the game gives players more than ten different options between the minimum of 1p and the maximum of £5. All in all, however, that does mean that the overall range of staking options stretches from just 5p to £25. Higher rollers, therefore, are likely to find that particular range prohibitively restrictive. There are some slot games which are definitively aimed at just one kind of player, and Bermuda Triangle is certainly one of those. The type of player in question, in this case, is one whose tastes are for slot games that are really straightforward and which take little attention or effort to play. 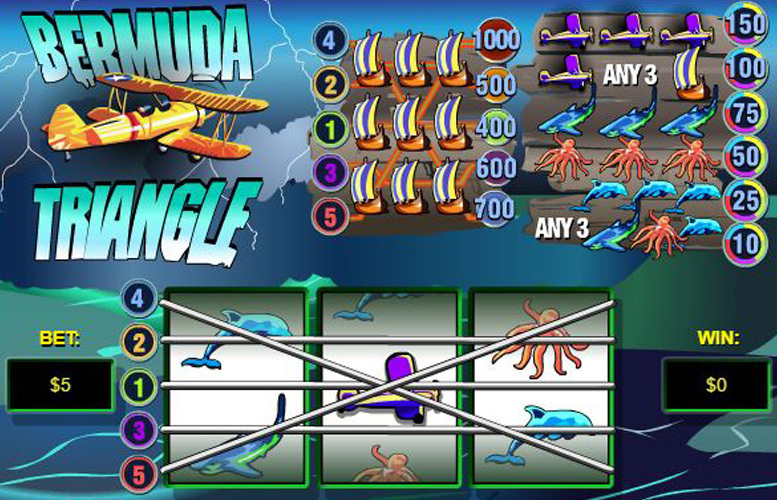 Bermuda Triangle’s gameplay, after all, is as simple as you can get and includes no bonus rounds, wilds, scatters or any other additional features. The slot, too, boasts only a very limited range of staking options, meaning that it also only suits players who prefer small stakes betting. Finally, the payline jackpots offered by Bermuda Triangle are also a lot lower than those found elsewhere but do occur a little more regularly. If you like huge jackpots, immersive gameplay and varied betting options, therefore, Bermuda Triangle is definitely not the slot for you.